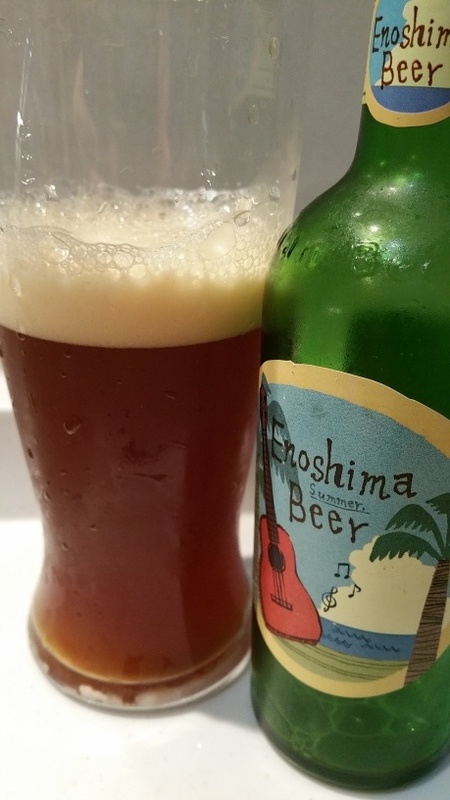 Enoshima Summer Beer is another special edition beer from Kumazawa Brewing, better known as Shonan Beer. Even though it does say summer on the label, I picked this bottle up mid-November and was still within date. Enoshima Summer Beer is apparently a hefeweizen, or an unfiltered wheat beer, that has been jacked up on hops. It can also be found around Father’s Day in Japan with a special edition Father’s Day label on the front rather than the one seen in the picture below. Reminds me of the state of the Enoshima beaches during the summer. Enoshima Summer Beer poured out a deep muddy brown colour that reminded me of some of the dirty beaches along Enoshima during the summer months that the beach bars are open. The hops weren’t the most apparent aroma, instead some malt notes came through and I was wondering whether the bottle of Enoshima Summer Beer was out of date? 25th December 2014. Hmmm. Strange one. The sediment at the bottom of the glass looked like someone had dumped some used coffee granules in there and had forgotten to wash the glass up. If anything, Enoshima Summer Beer tastes more like a bitter than a wheat beer but still is confusing at best. The aftertaste was fairly sour and bitter and seem to exacerbate the idea that this beer had gone off. I don’t really know how to sum up Enoshima Summer Beer; perhaps I was dealt a duff sample of it but it’s hard to know. Maybe when the next edition comes out we’ll get a better idea. We bought our bottle of Enoshima Summer Beer at a small store in Zushi. There is little else information about it online but on a recent trip to Le Collier, there was a bottle there. We also saw this bottle in World Gourmet in Yokohama.